After many successful years of reading clients all over the world with El Puro I have decided to also offer you the opportunity of have spells worked by with the Puro/Cigar. Tobacco spells are ancient in their roots dating back to the tribal shamans of the various tribes and groups found throughout Mesoamerica and on into South America. 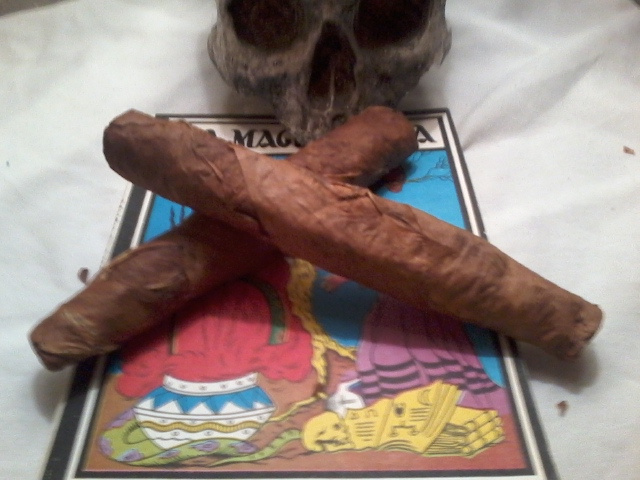 My personal teachings in the traditions of the Tabaqueros (tobacco Shamans) are based on what I have studied from my ancestral roots and what I have learned from studying Old Grimorios regarding Brujeria with the use of el Tabaco. For over a decade of of successful work in spells with El Puro y el cigarro I am now offering this work to those who are interested. Blessings for good fortune: Perhaps you have a business or are in line for a promotion or are some other venue and you need a boost of Good Luck! This can be performed with help of the Puro. Punish an evil doer (turn the tables on your rivals): Let the tobacco spirit bring judgment on an evil doer in the same way that wasps drive out intruders to their nest. These spells are possible no matter where you are in the world. Traditionally most of these spells are performed at a distance which means your presence is not relevant to their effect. The cleansing and protection are done both in person and also from a distance as long as certain requirements are met. To perform any of the above spells A picture and your full name and date of birth will suffice for the above spell work. With the positive spells listed above you will be sent the ashes from the spell to carry with you or place on yourself whichever the case is to continue its positive energy. The punishing spell you have the option of receiving the ashes of the spell to sprinkle where your enemy will come into contact with it or blow it to the four directions asking the spirits to lay their judgement on your rival.